Above: Beijing traffic is busy. "Moti" taxi speeding towards TianAnMen Square. Photo gallery below. When walking around TianAnMen Square, the center point of the Middle Kingdom, China, you can see Chinese tourists from every corner of the country. Chinese tourists come in large groups. People look happy when they see the Square and it's familiar, historical buildings. For most it's their first and only visit. Everyone wants to take pictures. 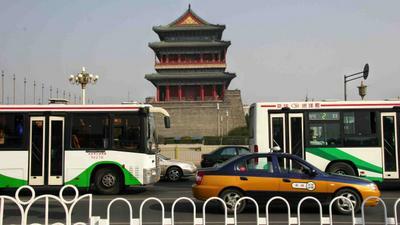 I stopped my taxi at south end of TianAnMen Square. First target was QianMen Gate, then I walked around Mao Zedong Memorial Hall. After, I passed Heroes Monument and continued towards People's Great Hall which is known for China's parliament meetings and red carpet receptions for foreign leaders. 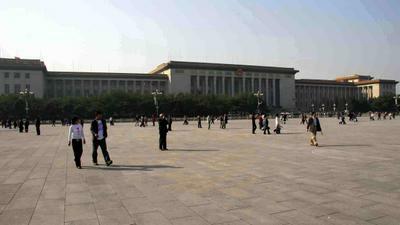 I went across TianAnMen towards famous Mao's picture at North end of the Square. 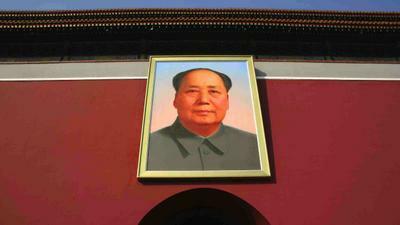 Mao's picture is on Rostrum's wall, above the corridor which leads into Forbidden City. Pictures taken by Canon 20D with EF-S 17-85mm and EF 70-200mm. Click to enlarge. Above-1: Taxi took me here, Southern end of TianAnMen Square. Buses are new type and that taxi is Beijing-made Hyundai. QianMen Gate. Above-2: QianMen Gate, Front Gate to Forbidden City, almost 600 years old. News say that its repair project (2007) had $1.1M budget. 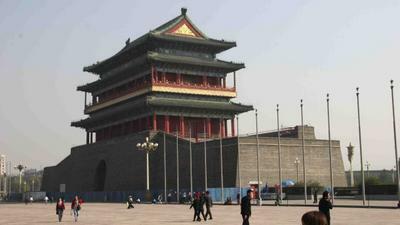 "Zhengyangmen (Sun-facing gate), popularly known as Qianmen, is located at the southern end of TianAnMen Square. 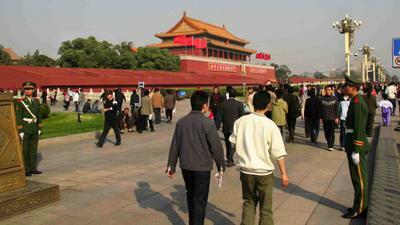 Being a proper gate of the inner city of Beijing, it lies on the south-north axis of old Beijing city. As the largest and most magnificent gate in Beijing, it is also called national gate." Above-4: JianLou, Arrow Tower is south side of QianMen Gate. JianLou was built in 1431, back in time it had connecting structures to QianMen Gate. 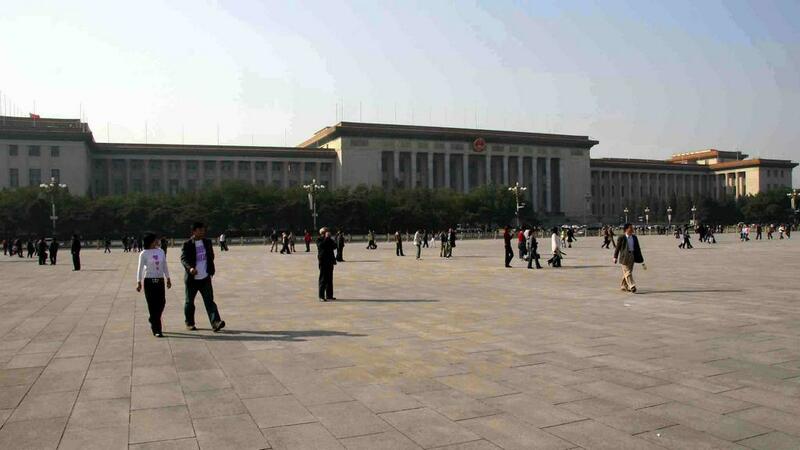 Above-5: Former railway station, located at south-east corner of TianAnMen Square, near QianMen Gate and JianLou. Now there is small shops and Internet cafe. 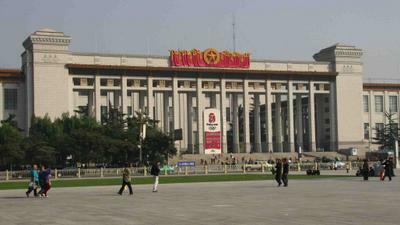 Above-6: Former railway station, located at south-east corner of TianAnMen Square. Clock tower. Above-7: Mao Zedong Memorial Hall, next to QianMen Gate, north side of it. Large statues around Memorial Hall. 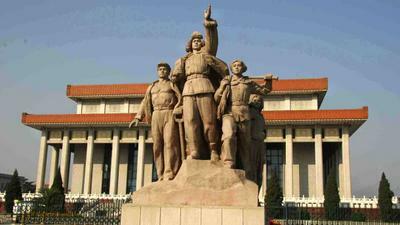 Above-8: Four major statues around Mao Zedong Memorial Hall. 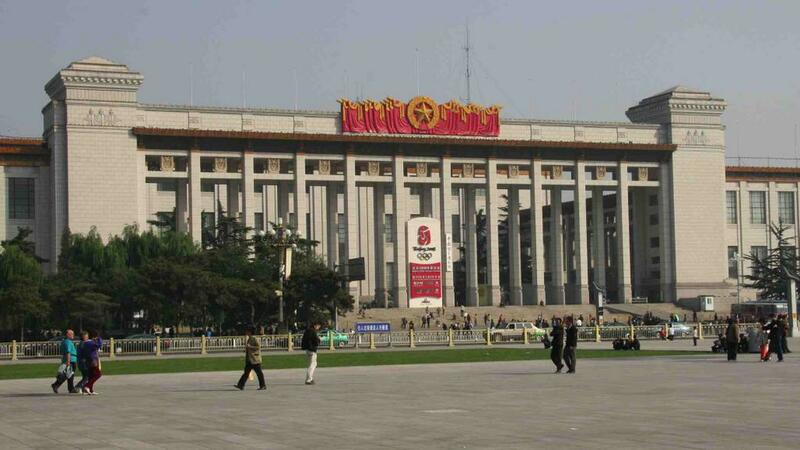 In the mornings visitors come to see Mao Zedong inside the Memorial Hall. Queue can be hundreds of meters long. 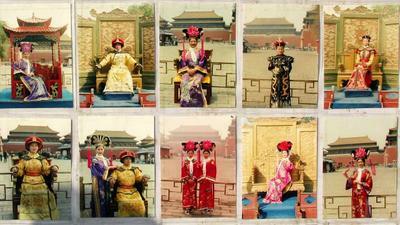 I did walk-through back in 1992 during my first trip to China. Then TianAnMen Square looked similar as today, but Beijing looked very different: no colorful clothes, no cars, only black bicycles, no modern apartment buildings, only a few office buildings and hotels. Then Chinese individuals hardly owned more than their bicycle. Now first generation of wealthier mainlanders have cars and apartments and consume. Above-9: Detail of a statue on south side of Mao Zedong Memorial Hall. Above-10: Detail of a statue on south side of Mao Zedong Memorial Hall. Above-11: Detail of a statue on south side of Mao Zedong Memorial Hall. Above-12: Information about Mao Zedong Memorial Hall, opening hours and more. Click to enlarge. Above-13: TianAnMen Square 440.000 square meters but when standing there, it doesn't feel so big, mausoleum and monuments take much of the space. 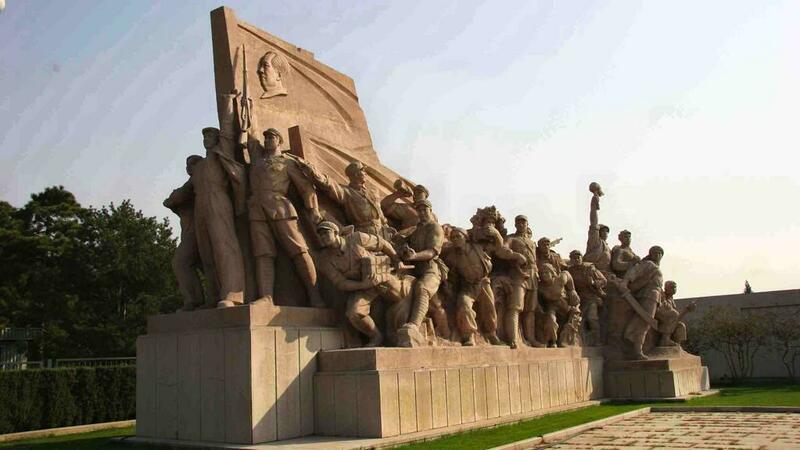 People's Heroes Monument, no more allowed to go the steps onto it. Above-14: West from People's Heroes Monument there is People's Great Hall, built in 1959, opened for visitors in 1979, 356 meters long and 206 meters wide. The main hall can take 5000 quests. Scale is in place. I have visited People's Great Hall for dance shows, concerts and a New Year party. From here behind the People's Great Hall (west of it) is the new Beijing Opera house, China National Grand Theatre, unofficially known as the Beijing Egg. Above-15: East from People's Heroes Monument is the National Museum of China. At entrance pillars, Beijing Olympic Games 2008 countdown clock. A few years ago here was a clock for return of Macao, Aomen as Chinese call it. Above-16: Official Beijing Olympic Games 2008 countdown clock, September 21st 2007. Above-17: Aside of People's Heroes Monument and looking towards North. 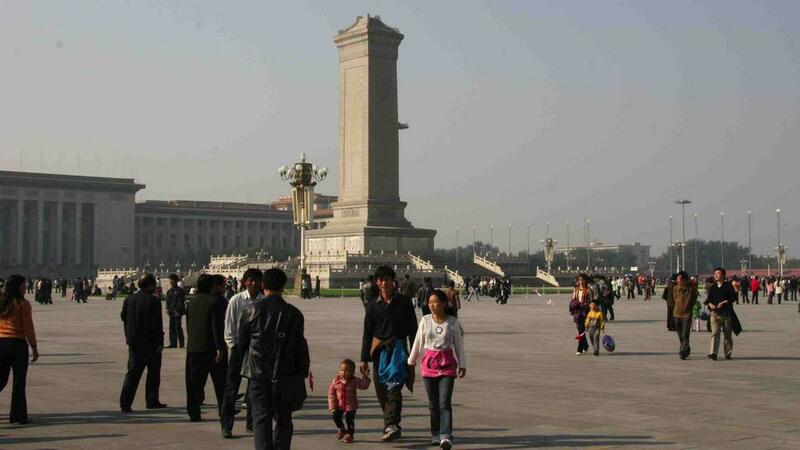 That is more active part of the TianAnMen Square. Usually visitors want to stay here some time. Behind the Rostrum is Forbidden City, left side of it is the ZhongShan Park. 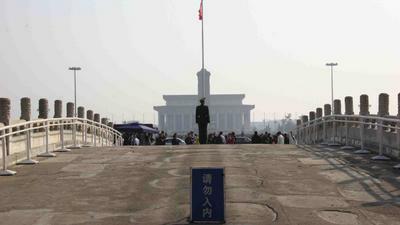 Above-18: Rostrum with Mao's picture is taken at north side of National Flag. 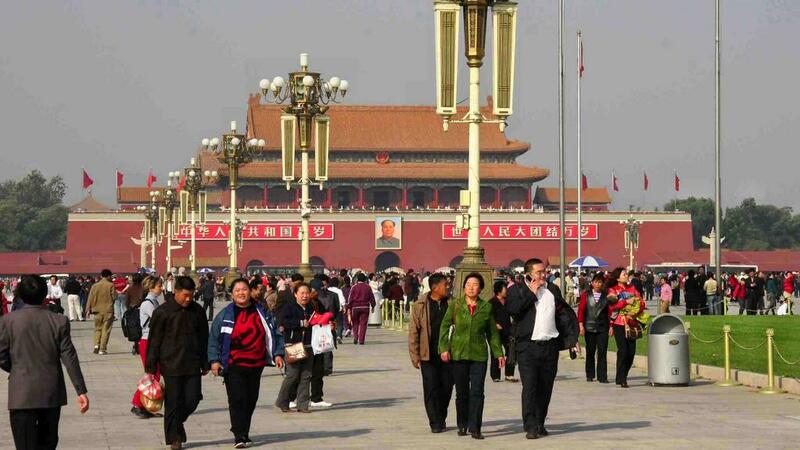 Between these people and Mao's picture is main avenue, a 38 kilometers East-West line. This part of main avenue is called ChangAn. Rostrum building has seen many historical events and parades. There Mao announced the birth of P.R.China on October 1st 1949. The corridor under Mao's picture goes through Rostrum building and leads into Forbidden City. Above-19: Rostrum with Mao's picture. Above-20: Rostrum with Mao's picture. Gray on left is National Flag pole. Above-21: Rostrum with Mao's picture. 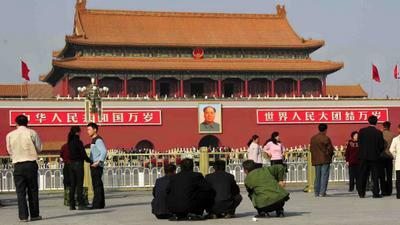 Above-22: Famous Beijing Hotel seen from TianAnMen Square. Above-23: Lamp art at TianAnMen Square. Chinese call these HuaDeng - flower lamp. Above-24: Clock tower belongs to Beijing Department Store Building, or Beijing Shi BaiHuoDaLou, at Wangfujing shopping street. 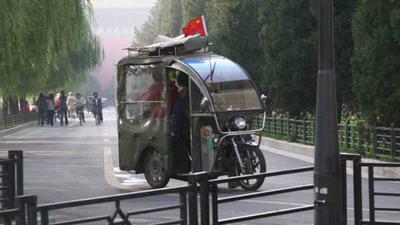 Above-25: At TianAnMen Square, Beijing. Above-26: The National Flag has guards. Goose walk is shown when guards exchange their shifts. Flag is raised at sunrise and taken down at sunset. People from around China come to see daily flag show. I have been there a few times, a silent work-out. Above-27: Flag ceremony starting soon. Above-28: The National Flag. In case of non-wind day, flag pool has its own solution. Above-29: On the way towards Rostrum building and Mao's picture. Above-30: Parades are organized so that troops march ChangAn Avenue from east to west. Leaders receive parade at Rostrum balcony. Red boxes are for diplomats and quests to follow the parades. 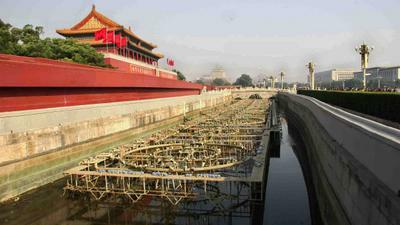 Forbidden City is surrounded by water channels. Water-show system installed into channel. Above-31: View from under Mao's large picture on Rostrum wall towards South: National Flag, then People's Heroes Monument, and finally Mao Zedong Memorial Hall. QianMen Gate and JianLou are behind Memorial Hall. This bridge was closed, Chinese sign means "entrance forbidden". 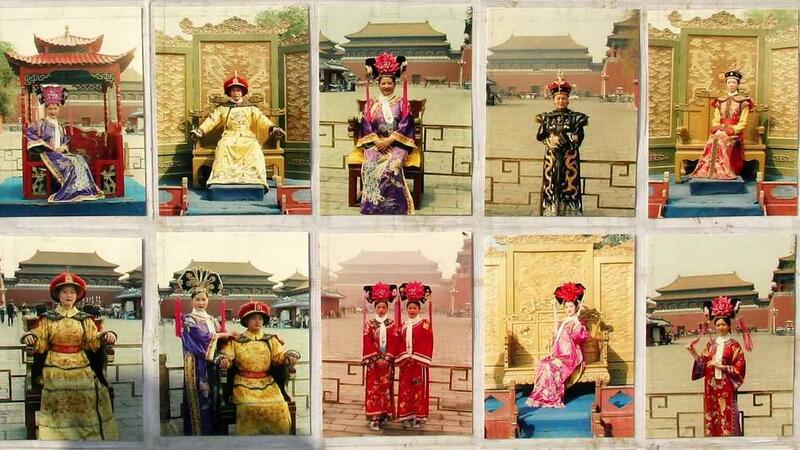 Above-32: Near Rostrum you can wear Emperor clothes and get photographed. Above-33: This is the famous Mao at Rostrum, on top of corridor which leads into Chinese emperors' home, Forbidden City. 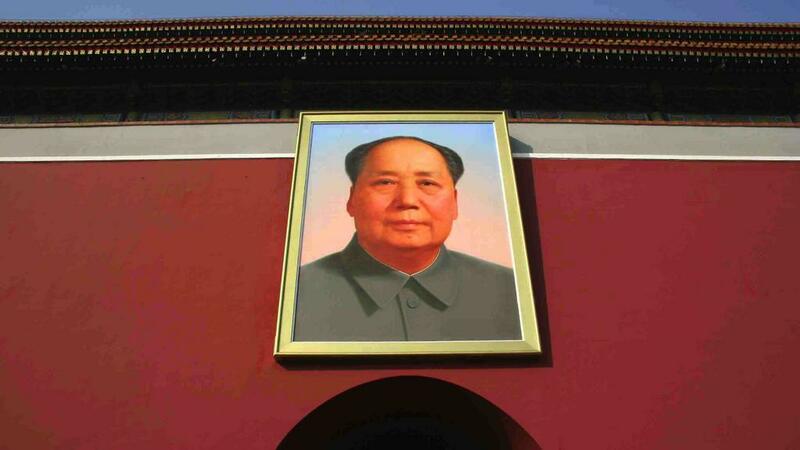 Mao's portrait size is about 4 * 6 meters, weighs 1.5 tonnes. Above-34: These ladies asked a picture with me, so this is my picture of them. Above-40: Rules at TianAnMen Square. Click to read. 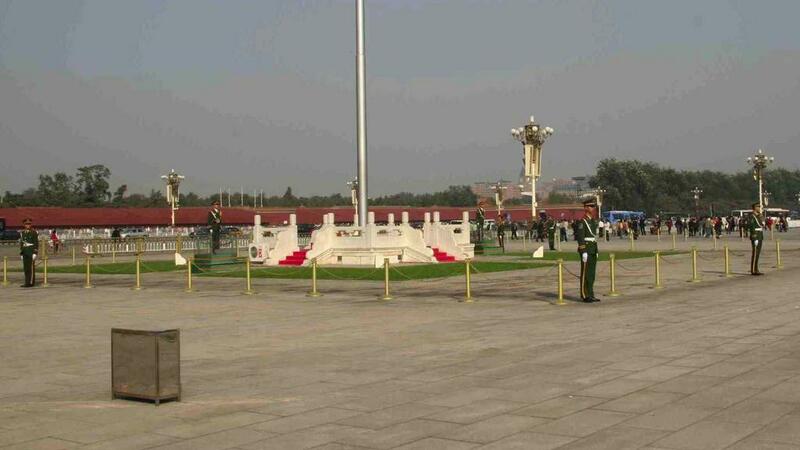 Above-41: Southern end of TianAnMen Square.